ACRYLITE® block makes a powerful statement. It’s distortion-free view enhances a product or message without distracting from it. 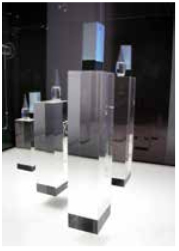 ACRYLITE® block has high mechanical and chemical resistance and is easy to work with, even in complex fabrications. It is eleven times the impact strength of glass and also monolithic. Three standard sheets sizes of 48″ x 96″, 78.740″ x 118.110″, & 80″ x 120″ are listed in the charts below with their corresponding thickness’ available. Cast Block is a special order. Thickness and sheet sizes are shown below. Minimums may apply.